Mission – Центр "Нова Європа"
Mission of the New Europe Center is to develop analytical research and conduct project activities in order to promote European standards and practices in Ukraine, as well as to increase support of Ukraine’s European and Euro-Atlantic prospects among opinion leaders and officials of the EU and the NATO. From October 1, the team known for the Institute of World Policy, develops the New Europe Center. Ukraine is changing, Europe is changing, and we are changing too. We have adapted our strategic priorities to the new challenges, i.e. 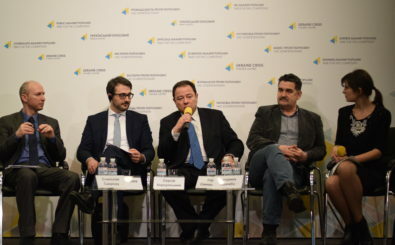 strengthening the effectiveness of Ukraine’s foreign and security policy; communicating the European and Euro-Atlantic choices in Ukraine; and communicating Ukraine in Europe and the USA. We imagine the “New Europe” as Europe without separating lines, Europe with Ukraine as its integral part. The new Europe is a combination of efforts and initiatives that would foster prosperity of Ukraine, the whole region, and the entire continent.